You can schedule Instagram posts from Later's Web App or the Later Mobile App! Tip: Scheduling through your desktop makes it easier to write more thoughtful captions, research hashtags, plan out the look of your feed so you can start posting more optimized and consistent content! First, you will need to upload the photos and videos you want to schedule into your Later Media Library. You can upload content from your desktop, Dropbox, or Google Drive. Note: uploading and scheduling videos is available on paid plans. Once your photos are uploaded go to your Instagram calendar. Next, drag and drop a media item from your side library onto the calendar at your preferred time of posting. Tip: Set up a Quick Schedule from your Instagram calendar by double clicking on a timeslot and repeat to select all your preferred times to post. Then bulk schedule posts! Edit the crop (square mode, landscape, portrait, free mode). Use Saved Captions (ie. your most commonly used hashtags). Adjust the time/date of your scheduled post. Add up to 5 linkin.bio links (paid plans). Now, if you have Auto Publishing enabled for your Instagram business profile, you can select if you’d like your post to be published automatically or posted via a mobile Notification. Finally, click Save to finish scheduling! Important: Only Instagram business profiles can auto publish single image and video posts. Carousel posts will still need to be published via a notification. Tip: Once you’ve scheduled a number of posts, check out what they will look like on Instagram with our Visual Instagram Planner! Rearrange your scheduled posts until you're happy with the look of your Instagram feed! Your post will automatically be published to Instagram at the scheduled time. This feature is available to Instagram business profiles and single photo and video posts only. To schedule a carousel post, use Notification publishing. What can't be auto published? If you’re a personal Instagram profile and want to take advantage of this you can set up an Instagram business profile too! First make sure to download the Later mobile app and grant Later permissions to access camera roll and to send notifications! Now let’s get ready to publish our posts via the mobile app. When it's time to post, we'll send you a mobile notification. Make sure you’re logged into the right Instagram profile. When you’re ready hit Open in Instagram. The post will open in Instagram. Here you can add filters, select video cover photo, etc. From the caption field, tap and hit Paste to paste in the caption we automatically copied for you. You can also add tags and geo-tags here. Click Share to publish to Instagram. 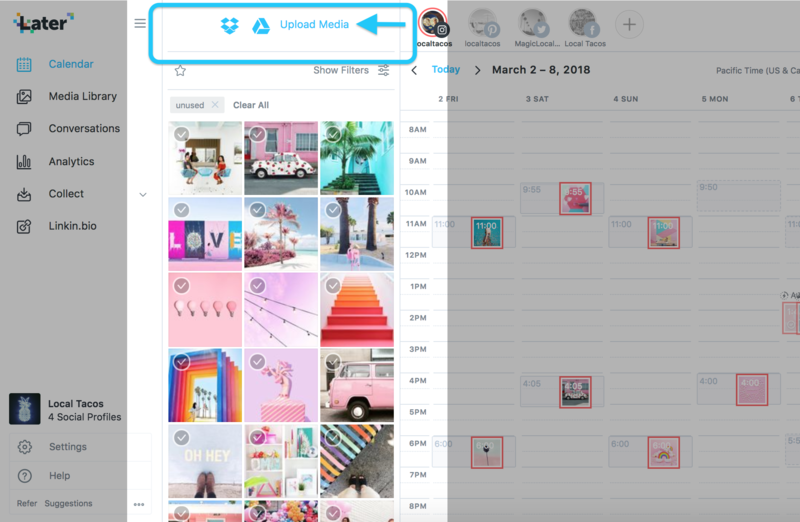 Scheduling and publishing multi-photo posts in Instagram works a little differently - if you are looking to schedule and publish posts with multiple images and videos, check out this help guide!